Deciding between mediation or a courtroom divorce can seem difficult. More people are familiar with the idea of a courtroom divorce than they are with the reality of divorce mediation. Some couples aren’t even aware that mediation is a possibility. But at Split Simple, we have years of experience providing clients with the benefits and advantages of mediation. Every case is unique, and we can’t say the divorce mediation is the right path in every case, but we’ve rarely run into any problems that can’t be solved via mediation. If you want to learn more about how Split Simple can help you with Chicago divorce mediation and divorce mediation services in Denver, please call Split Simple today at (855) 665-9920. What Are the Advantages of Your Process? 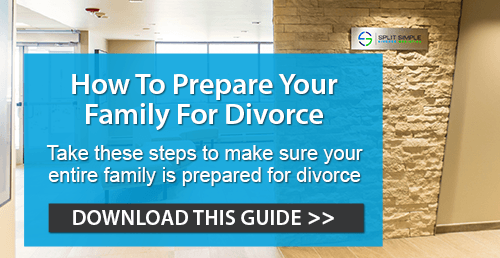 Split Simple’s uncontested divorce process has been honed over years of experience. It’s a rigorous, data-driven, transparent system that values your time and money, while leveraging the most recent research to create parenting plans that address child care issues in a way that’s best for your family. If you’re like most of our clients, you expect everything you invest in to have a proven track record of success. Our attorney-mediators can boast of just such a track record. A calm, relaxed, professional, productive and drama-free environment. Our attorney-mediators work with both parties, so there is no adversarial dynamic. We save you money in both the short run and the long run. Our pricing is completely up-front and transparent- there are no surprises at Split Simple. Studies show that children whose parents opted for a mediated divorce have better outcomes and experience fewer problems than those whose parents chose a traditional courtroom divorce. Agency – in a Split Simple mediation session, you have the opportunity to thoroughly discuss the issues and play a significant role in forging an agreement on those issues. Transparency – we make sure all decisions are completely clear and understandable. We share summaries of each session with both parties after the session is over. We know you have questions, and we welcome them. We’re confident that a full consideration of the advantages of mediation will lead you to choose Split Simple and our experienced attorney-mediators. If the idea of a smarter, simpler and cheaper divorce process intrigues you, please call us today at (855) 665-9920 or contact us online for Chicago divorce mediation.